Geeks like their science fiction and one of the most popular franchises for many is Star Wars. The movies have been popular for years and spawned a number of replica and toy products from all six of the films. One DIY geek wasn’t happy with the quality of the lightsaber replicas on the market so he rolled his own. 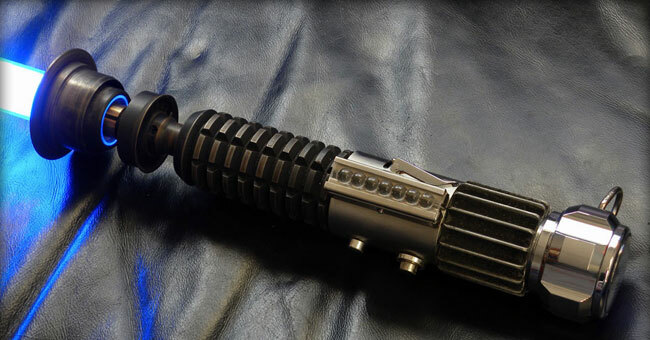 The result is a replica of the lightsaber Obi Wan Kenobi used in the New Hope flick. The guy created the lightsaber pretty much from scratch using a lathe and other power tools to make the thing out of metal. The website of the maker takes you through all of the steps. This is not the kind of thing that a beginner would be able to tackle from the looks of it. This is definitely an advanced project. The results are so cool and the lightsaber looks like something George Lucas would have built.